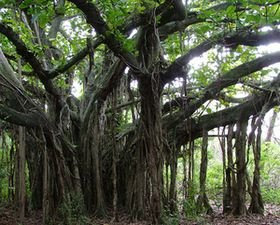 The Banyan tree is one of the important trees in Bali. Mostly Pura Dalem and Pura Mrajapati (the temples which are located next to the cemetary) have a Banyan tree. For Balinese people, the Banyan tree is a sacred tree which is used for religious rituals. That's why they are wearing a sarong, usually yelow or black and white fabrics tied to their trunk. According to 'lontar' (which are dried, pressed and blessed palm leaves, tied together to make a small vertical book which the ancient Hindu teaching are written on), there is a story about a banyan tree. It say that the goddess Parwati made a mistake so God Shiva, her husband, punishes her by making cleansing for 8 years in the cemetary area. So goddess Parwati transform herself into a female giant called Dewi Durga. After the punishment time is over, God Shiva comes to earth to meet his wife and God Shiva transform himself into a male giant called Kala Engket. Even though they've been separated for a long time they still have kama (sexual desire). Well after that, what happens was Shiva's sperm spilled and scattered on the ground and grew up as three kind of trees, they are: the Kepuh tree, the banyan tree and the Pule tree. So these trees then became special to Bali. The Pule tree is used to make sacred masks such as the Barong mask and the Rangda mask. The leaves of the Banyan tree are used in cremation ceremonies. The Banyan tree grows from the seeds inside its fruit. The seed of the fruits of the Banyan tree are small as sand on the beach and the trees can life for hundreds of years.